On work days, I typically keep prep and cook time of breakfast to less than 10 minutes. It’s usually something easy like an egg sandwich or hash browns with an over-easy egg. This week I felt motivated to transform a mundane Tuesday breakfast to a special treat by making Chorizo Quiche with a Hash Brown Crust. 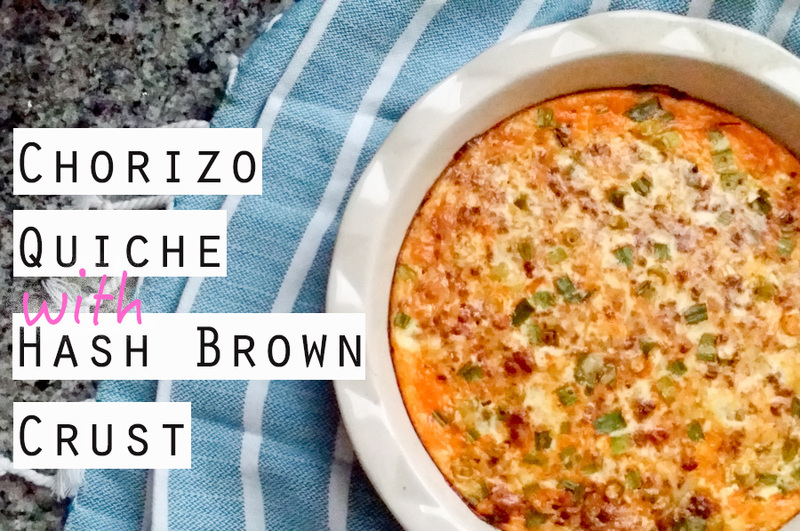 I normally use ham or ground sausage for my breakfast quiches, but Sugarface voted for chorizo and I am a chorizo fangirl! Having never made a chorizo quiche before, it also added a touch of novelty to our special breakfast. To save myself some sleeping-in time, I baked the crust the night before. This meant this delicious Chorizo Quiche with Hash Brown Crust only required an extra 30 minutes of getting-ready-for-work time. You can get ready for your work day as it bakes! Grease the bottom and sides of a 9 inch pie dish with melted butter. Press the hash browns into the bottom of the the dish and along the sides to form the crust. Lightly season the hash browns with salt and pepper. Bake in oven for 30 minutes or until the crust is golden brown. While the crust is baking, mix chorizo, half & half, cheese, and onions in a mixing bowl. When the crust is done, lower the oven temperature to 350. Pull out the crust, pour the egg mixture into the crust, and put the pie dish back into the oven. Bake for an additional 35 minutes or until the the quiche is puffed and light golden brown. Garnish with green onions and serve with sour cream. How have you made a mundane day feel special? Previous article Gourmet by Numbers and a Giveaway!